Last time, we shared a story about a 2-year-old who threw a tantrum while her parents tried to get her strapped into her own seat on an airplane. After a few minutes, her parents were able to get her secured in her seat but shortly after that, they were informed that the pilot had decided to have the family removed from the plane. This is obviously not something that happens very often. In fact, the family ended up in the news because it was so unusual. Since none of us was on the plane with this family, we have no idea what really happened or what might have been done to prevent the situation. However, in today's post, we want to share some information about 2-year-olds that might help those of you who are planning for a plane trip soon. 1. Two's use "scripts" to make sense of the world. Imagine if you had been suddenly dropped into an unknown country with customs entirely new to you. You don't know your way around, you only know some of the language, and every day you find yourself completely confused by something new and strange. While you might be excited about exploring this new place, you would want to make sense of things as quickly as possible so you don't get lost or make mistakes. This is not too far from how older babies and toddlers must feel. Their desire to learn and explore is very strong but they do want to feel like they know what is going on. Young babies learn to connect actions and outcomes (like feeding cues and being fed) but that is not enough to understand the world. Toddlers must string together actions and events into "scripts" about how the world works. For example, toddlers learn that at dinner time, they smell something cooking, they are lifted into their high chairs, they are given food, and everyone talks while they play with their food. They will learn scripts for bedtime, scripts for going to day care, scripts for going to the park. When toddlers are not able to predict what is happening, they will cling to their parents (and refuse to sit in their own seats). While it may not be possible to make a "plane script," you can help your child make a "traveling" script by having a routine when you travel by car and/or by repeating stories about each step that happens when you fly. 2. Two's cannot control their emotions once they get out of control. Many people assume that children have the same ability to control their emotions as adults do. They do not. Just as you would not expect a two-year-old to understand algebra, you should not expect that she will control her emotions once they get out of control. Two's are not developmentally ready to do that. The trick is to prevent the meltdowns in the first place. 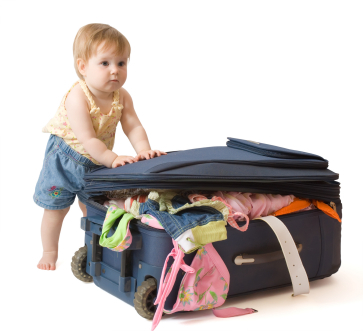 While you can't always do that, developing scripts, watching for cues, and doing what you can to keep your child physically comfortable (with naps, snacks, and cuddles before plane rides), you can do a lot to help your child travel without tears. 3. Two's look to their parents to help them know what to think and feel. Public tantrums are stressful and embarrassing. We all want our children to behave and not to disturb other people. When they don't, it is hard to stay calm and in charge. But that's what your child needs you to do when she loses control. If she is starting to lose it, seeing you panic will make things much worse. She watches you to figure out what she should be feeling. She needs you to be firm, strong, and calm even if other people are upset. Use your face and body language to help your child understand that things are ok even if she isn't familiar with what is happening. So, if you are traveling with your 2-year-old anytime soon, do your best to help your child learn a "plane script" by telling stories, practicing sitting in the car seat, or by imaginary play. Watch for early cues that your child is becoming overwhelmed and do your best to address the problem before it gets out of hand. If, despite your best efforts, your child becomes upset, stay calm, firm, and use your voice, face, and body language to show your child that you will keep her safe.